If you follow SSD on Twitter, Facebook, or Instagram, you probably saw the insane amount of posts about our jewelry being on the season premiere of the FXX show, The League. It all started back in June. I got an email from the costume stylist from the show about possibly sending in some of my jewelry for their show. I couldn’t believe it! I have been watching The League since college, and I dabble dominate in a little Fantasy Football myself. I emailed the stylist back and said I would be more than happy to submit some of my pieces for the show. I never really wanted to get my hopes up since stylists usually have hordes of jewelry and clothing to pick from, so the chances that my jewelry would be picked were still slim. 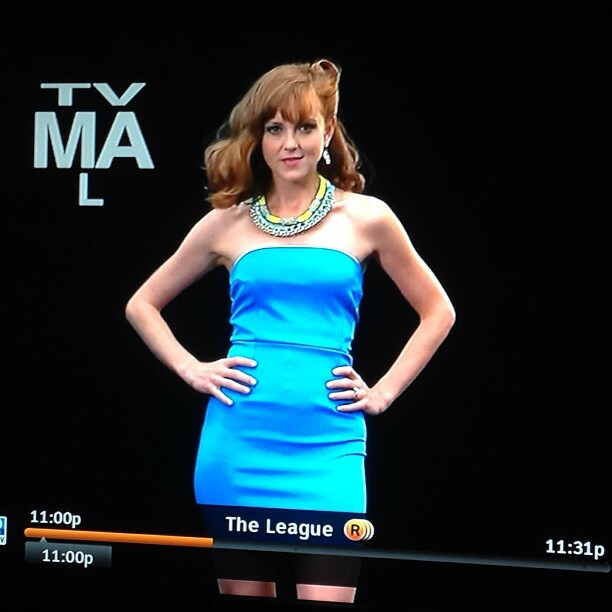 Four grueling months later, the first episode of The League aired and within 1 minute of the show, I saw our Nautical Necklace and our Neon Yellow Statement Necklace on the fabulous Jayma Mays! You may also know her as Emma Pillsbury from Glee (another favorite of mine). The stylist contacted me to also let me know that my jewelry will be on next week’s episode as well, so be sure to tune in, and see if you can spot a little See Song Designs sparkle on a Jayma again 🙂 If you missed this week’s episode, check out the scene where Jayma wears our jewelry here and some haphazard snaps I took while watching below! Another shot of Jayma wearing our necklaces!